More Jumble Sale Challenge - I've been playing about trying to make the biggest ITH bag I can. 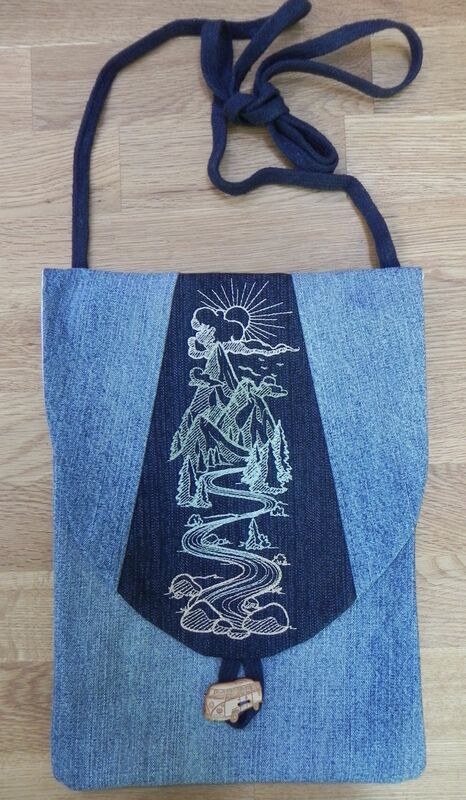 This one uses recycled jeans and is about 28cm x 20cm. The design on the centre panel is from Urban Threads. Love this design and the shape of the bag is unusual!! Great job-- Love it!! Love your bag and design, but where did you find that great button? It isn't really intended to be a functional button - they were sold as "embellishments" on the Pinflair stand at an exhibition. Great bag Sue. Just love the denim. Nice use for jeans! I like how you did the flap! Lovely bag and great use of that UT design! Thanks for the idea, Sue. Its time I recycle my jeans too. Hugs ...Shyam. Oh, I love the look and size of this one! And you can't go wrong with an Urban Threads design as far as I'm concerned.... somehow I missed this design during their sale last weekend - darn it! It is one of their sleeve designs and fairly recent. LOL nearly 12 x 9 in your quaint inches! Ah thanks Sue now i get the picture in my minds eye!!Thank-you! !